Google AdWords has added a feature that lets you sign in with one account and quickly switch between different AdWords accounts without using the MCC (My Client Center). Google is calling it "multiple account access and management." The new features improves multi-account management where you can now access multiple accounts with a single login, quickly switch between accounts, and invite new users. 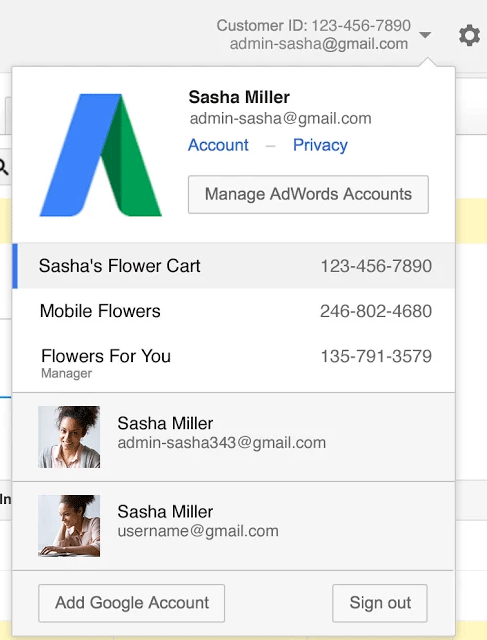 You can now associate up to 5 AdWords accounts (including manager accounts) to a single email address. You can invite new users to access your account with a single click.. Once your colleagues receive your invitation, they can start accessing your account right away -- no email confirmation required. (2)Click Manage AdWords accounts from the drop-down menu. Previous story: Another Big Google Keyword Planner Bug Requiring Active Campaigns?